“Never let your disadvantaged background be an excuse to stand still. You need to keep moving forward,” says Cam Ngoc Viet, who works as a housekeeper at the Hilton Hanoi Opera Hotel in. Growing up in the Yen Bai district in rural Western Vietnam, Viet was once considered a member of Vietnam’s most disadvantaged youth. He has one younger sister and one older brother who had lost his eyesight due to a lack of medical treatment. Growing up, his father became more dependant on alcohol, and would often get drunk and beat his wife and children. To Viet, his mother was, and continues to be, his only reason to live. At the age of 15, Viet decided to quit school and move to Hanoi so he may earn a living for his poor family. With no degree and no identity documents, Viet spent sleepless nights working at a construction site as a guard. There was no day-off, and no health insurance. Compared to other countries, Vietnam has a relatively high youth unemployment rate of about two-thirds of the overall number, according to the 2018 International Labour Organization. Despite the nation’s 97 per cent literacy rate, inadequate training from universities has created an imbalance between supply and demand for skilled workers. Many youths suffer from lack of decent work opportunities. For disadvantaged and less educated youths like Viet, it is even more difficult to find promising employment opportunities. 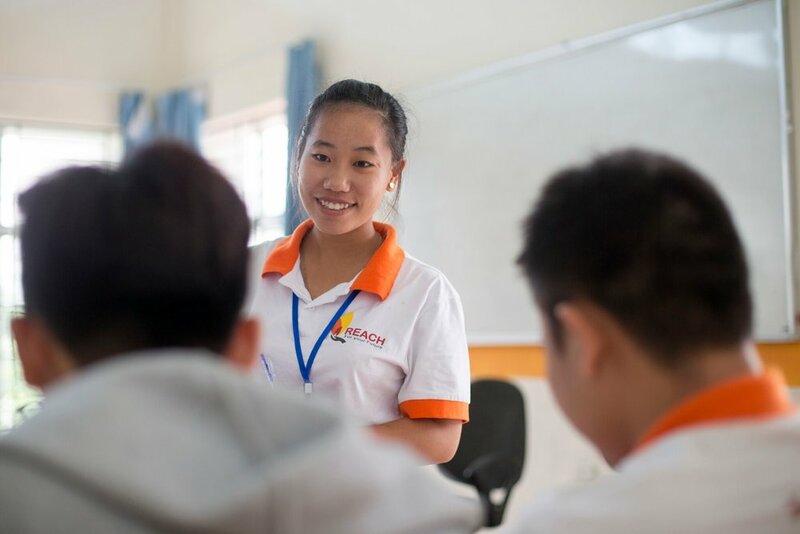 REACH is a non-profit organization which specializes in providing vocational training, career advice and job placement services for Vietnam’s most disadvantaged youth. They partner with different groups and organizations including the Department of Social Crime prevention, Peace House Shelter, Hagar, and Blue Dragon to provide different services for marginalized groups such as human trafficking survivors and those impacted by domestic violence. Viet was lucky to be introduced to REACH’s Youth Career Initiative Program (YCI), which has helped him gain a number of soft skills and find his passion working in the housekeeping department at the five-star-property, Hilton Hanoi Opera. YCI is one of REACH’s many programs that helps youth gain hands-on experiences in a variety of hotel departments. Graduates go on to earn competitive wages with small, medium, and large hotels in Vietnam. “When I was interviewed, I told them that I was a shy and timid person. I was surprised that I was selected to study at Hilton Hotel,” recalls Viet. At first, it was not easy for him. Two weeks after Viet started his training, his sister had a convulsive fit and was sent to hospital. He was going back and forth between the Hilton for his training, and the hospital to look after his sister. However, he persisted in face of hardship with great determination, and gained trust from his co-workers and supervisor. Later on, Viet was offered a permanent position at the hotel. Now, he earns enough to cover his living costs in Hanoi and is also able to send a small amount to support his family. Since its establishment in 2004, REACH has successfully helped over 11,000 disadvantaged youth find jobs. Each staff at REACH cares about the well-being of every member. They provide follow-ups and strong support during the transformation process. In return, they ensure students are as committed as them. “Before the students join the REACH program, we not only assess them on their suitability in training areas they apply for, but also on their commitment and desire to find jobs. We want to make sure that our students are those who are serious about learning a vocational skill and find jobs,” says Mai Pham, in-country coordinator of REACH. As an alumnus of REACH, Viet has become a good public speaker. During his YCI graduation ceremony, he shared his experience with REACH’s training program and how effective it was in helping him grow. His younger sister followed in his footsteps and has participated in the following year’s YCI class. Watching youth grow and develop is a rewarding process. In the near future, REACH is looking to improve and expand their YCI program to empower more youths for a brighter future. However, fundraising is a major challenge. “The winding down of foreign aid in Vietnam has increased as the country has graduated to middle-income status. It would be more difficult for REACH as an organization to mobilize enough funding to cover all program cost,” says Pham. Young people have great energy, and many times, they just need the right opportunity to put passion into action, as examplified by Viet. “I am very lucky to have a chance to experience a five-star work environment. It is many people’s dream. Therefore, I really appreciate and value this opportunity. I will try my best not to let it pass,” says Viet. Click here to learn more about REACH, and how you can help.